Skating promotes overall fitness and improves balance and coordination. Adult classes range from basic skills to specialized experiences in hockey, figure and speed skating. Moms, dads, grandparents and caregivers can participate in Sendik’s Skating School at the Pettit classes at the same time as their “young charges, ” thanks to the Pettit’s family-friendly schedules. New for the 2015-16 Sendik’s Skating School Season: Each participant registered will receive one (1) free Sendik’s Skating School T-Shirt per season (not per session). The participant will pick up the shirt on the first day of classes and select the size of shirt at that time. Please Note: Skate Rental available, but not included in registration price ($18 for the six week class). You can purchase skate rental on the first day of your class and as always, you are certainly welcome to bring your own skates. 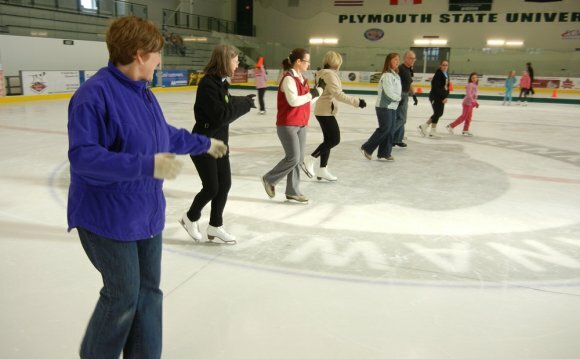 The adult curriculum is designed to promote overall fitness, while mastering the basics of ice skating. Divided into six levels, adult skaters will progress at an individual rate. Want a little extra time with an instructor? Class participants now have the option to add on a weekly 15 minute private lesson during their designated practice time. The fee to take the fast track to success is only $60, but hurry because space is limited and will fill quickly. Register through the “Register Free Online” button below. Online registration will close at 12pm the day before each day’s first class.